The auto industry is on track to shatter the 2004 record of 30.8 million vehicles being recalled. It’s becoming the year of the recall: Automakers have recalled more than 28 million vehicles in the United States this year – more than one in 10 vehicles on the road – putting the industry on track to trample the 2004 record of 30.8 million. On Monday, Japanese automakers Honda and Nissan recalled close to 3 million vehicles worldwide to repair an air bag problem. Coupled with a recent Toyota recall to fix a similar problem, it means that in just the past month Japan’s three largest automakers have called back more than 5 million vehicles worldwide to fix faulty air bags. It’s unclear how many of those vehicles are in the United States. 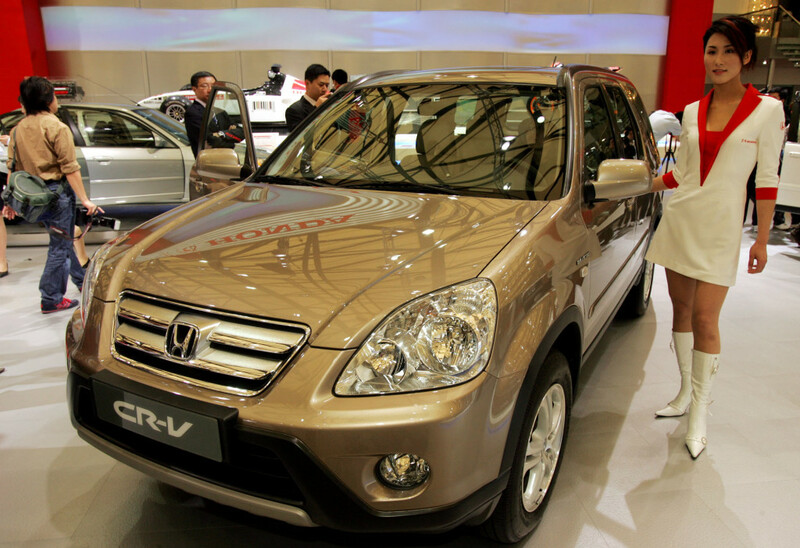 The 2005 Honda CR-V is one of the models being recalled for defective airbags. Industry analysts see two big factors behind the flood of recalls: Automakers everywhere are being extra careful after seeing Toyota get slapped by a $1.2 billion fine this year to settle charges that it hid safety problems from customers and regulators. And there’s the debacle confronting General Motors, which faces multiple investigations for taking more than a decade to recall cars equipped with a defective ignition switch linked to at least 13 deaths. This year has been the worst since government began tracking auto recalls in 1966, and summer has just started. In February, GM started recalling 2.6 million Chevrolet Cobalts and other small cars equipped with defective ignition switches. So far this year, GM has ordered 44 recalls covering 17.7 million vehicles in the United States and more than 20 million in North America, the automaker said. The U.S. recalls account for nearly two-thirds of all recalls in the country this year. “Almost all automakers are doing a large number of recalls,” said Arthur Wheaton, an automobile industry specialist at The Worker Institute at Cornell University. Many of the defects have been serious: faulty ignition switches, overheating exhaust parts, power steering problems. But others, not so much: This month, GM recalled 184 Chevrolet and GMC trucks that were equipped with floor mats prone to move under the driver’s feet because the vinyl floors have no attachments to secure them in place. GM also recalled more than 57,000 trucks whose chimes did not work if a key was in the ignition while a driver’s door is open, or a front seat belt is not buckled. The cost of recalls can put a financial strain on automakers. GM estimates that its recalls will take $2 billion off its bottom line this year. But for automakers and dealers, there is also an upside. Analysts say that at least two in three recall notices is fulfilled, meaning that dealers get to have their old customers back in the showroom. There, they can show off the new models, and, at minimum, be in a position to sell drivers on other repairs.